Sing, dance and hug like a sweet happy troll in our new DIY Poppy headband! Step One: First make the base of the headband using a this tutorial. 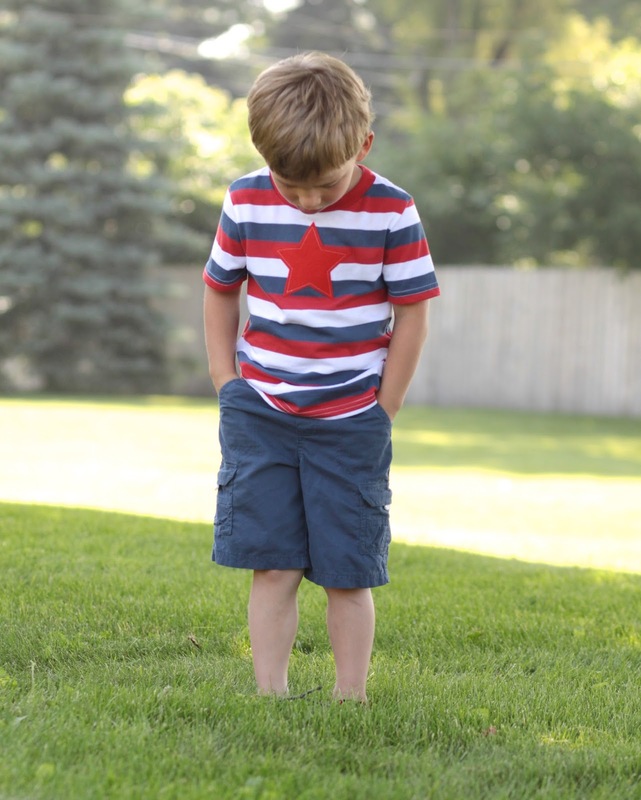 We used a sewing machine but we also offer a no-sew option too! Step Two: Print off your pattern. You can use basic copy paper and pin the paper to the felt and cut out around the pattern. We really like using freezer paper as it is printable and gives a smoother cut! To use print just like printer paper and lightly iron to felt (waxy side down). You can even reuse the pattern by ironing again! The Clover Felt we used for accent greenery and the Peacock felt for the flowers. Step Three: Cut out six flowers total. We layered two flower cut-outs together to give the headband a bit of dimension. Sandwich the green accent pieces between the flowers. Here you can decide to glue or sew the flowers together. (Sewing tip: we like to mark the exact center with a disappearing pen -it helps us to sew more even lines!). Attach to the headband with glue and you're ready to be Princess Poppy! You know you're going to want one in every color -and you might as well! These felt covered headbands are simple to make a great base to embellish! 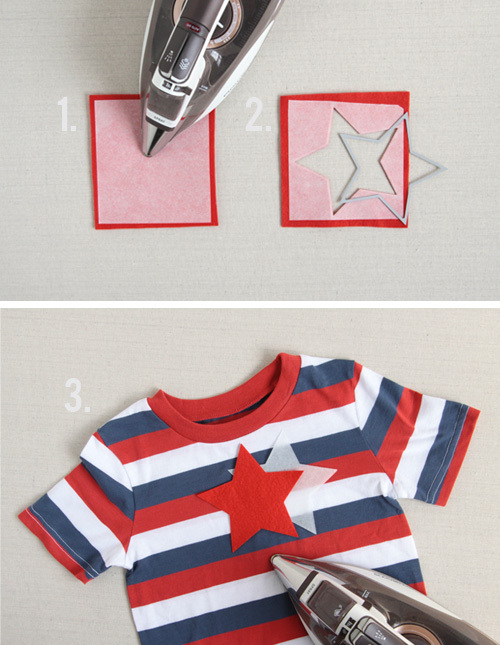 You can assemble these using a sewing machine or by using glue -both methods are described below. You will need two strips of felt 1/2" by 16 1/2" long to make one headband (or go ahead and cut a bunch to make a rainbow!). You can vary the width of your headband by how wide you cut the strips. We find that the best way to cut long strips evenly is with a rotary cutter and ruler -but you can also mark your felt with a disappearing marker, a sharp scissors and a steady hand. Here you can choose if you want to make this a no sew project or add the extra details of stitching! You can hand stitch with embroidery floss but we used a sewing machine! Carefully line up the two strips of felt. Start at on end and stitch all around leaving the end open -making a sleeve for the metal headband to slip into. Place the headband in the open end and slide felt over the metal headband. Stitch felt closed (careful not to sew over the metal band!) and trim to size. Glue one side of the strip of felt. We like using Tacky Glue. You only need a little bit to get a strong but flexible hold. If you use too much it will soak through the felt making your headband stiff. Carefully sandwich the headband between the two pieces of felt -pinching the length of the felt together to adhere. It's time to try it on! Check out our Poppy Floral headband & our Rarity Unicorn headband! Get holiday ready. Deck your wall and warm your heart with our DIY Merry Magnolia Wreath (as seen in Better Homes & Garden's Make it Yourself magazine!). At Benzie, we love it in Moss colored felt trimmed with our white handmade poms but Benzie's Meadow felt with accents of Zucchini would give it the true Magnolia wreath feel. A no-glue and no-sew project too! Grab your supplies below. First, grab your stack of felt leaves (skip the scissors and use our precut shapes) or cut your own almond shaped leaves out of yardage. Our large leaves are about 3 1/2 x 2 inches wide and our small leaves are about 2 1/2 x 1 1/4" inches wide. To give the wreath a full appearance we folded the tip of each leaf over each other and use the stick pin to attach to the styrofoam wreath. Continue to place the leaves row by row -pinning each leaf about 1/2" to 1" apart from each other. You will only pin leaves to the front and sides of the wreath. The back side will remain unfinished. Continue until the wreath is completed. Use leftover leaves to fill in empty spaces. Lastly, grab the felt poms and stick the pin through the edge of the pom and carefully pin to the wreath hiding the pin in the back side of the pom. A beautiful full wreath to decorate! Go all out and add some magnolia flowers to it -get the diy! Add any felt shapes to make it your own! Using pins allows you to update and switch things up any time you please! Happy Holidays! Our favorite desert darling — the cactus! Craft your own prickly plants with our handy diy below! Wool Felt -Our Cactus Palette is perfect! Print out the pattern (or freehand your own design) on basic copy paper and cut out the cactus you want to use first. Grab a 6x9" sheet of felt, fold in half and pin paper pattern in place. (1.) This is where you'll take out your sewing machine and sew right on the paper pinned felt -it's so easy! We love this method for tracing and sewing patterns, just make sure to leave the bottom open for stuffing! (2.) To remove the paper just gently tear the paper away from the felt. (3.) Grab a sharp scissors and trim about 1/4" inch around the stitched line. (4.) Finally -grab some fabric paint and stipple dots over the cactus. We used a sheet of paper to help us make even lines. Let dry over night and repeat on opposite side. And just a shout out to this fabric paint -we tried several different kinds of paint and found we loved the flow and puffiness of this paint the best! Keep a steady hand and you'll have a whole prickly forest soon! Gently fill your cactus with polyfil. Heat up that hot glue gun annd stuff the bottom of your pot with a little polyfil. Then do a little bit of mix & matching to find the best prickly pairs (did you get that pun?!) and hot glue the bases together for a bit more stability. Strategically glue poms in place around the cactus and base of the pot. You're almost done! Grab the pattern to cut out the accent flowers. I used about 5-7 flowers per pot placing them on the tip of the cactus or accents in the felt rocks. Our fine tipped glue gun is perfect for detailed work like this! Enjoy your new desert darling! We all love succulents, thick petaled plants -smooth, symmetrical and in a beautiful array of greens and blues -natures bouquet. These little beauties also translate well into felt -and these will fare well in all types of weather too! To make quick work of these we suggest using our precut ovals -or felt-fetti as we like to call them! You'll want to have both the large and small sizes.You can also freehand cut circles or trace them using freezer paper. Regardless -you'll want a big pile of ovals to work with! Felt! Sweet Succulent palette or go for our Felt-fetti. Felt Pom Poms, we used a variety of our sizes in the color Stone. Item to decorate, we used birch tree stumps. To make the succulent center take one small oval -fold in half twice and use just a bit of glue to secure. Then take 3 ovals -fold in half and form around succulent center. Continue attaching ovals on the underside of the plant to form your succulent. You can make them large or small by selected fewer or more ovals to attach. To make the centerpiece I used 3 various sizes of birch logs -glued on some moss -arranged the succulents and placed felt pom poms to resemble pebbles that succulents often grown in. I also scattered a few around the base of the centerpiece. A great focal point for your table -or how about try a felt terrarium or decorate grapevine wreath? Let me know what you make! Can I wash felt? A tutorial about felt applique. This is a craft question that I get asked quite often -can I wash wool blend felt? And as you can see from the felt star appliqué -yes you can! But before we get to care instructions let's talk first about fiber content. Our felt contains both wool, ranging from 20-35%, and rayon. Rayon, or known as viscose, is made from wood pulp -a renewable source too! Most of us know what happened to our adult sized wool sweater when we tried to wash it -it shrunk down to a child's size! Wool should be treated with much care or it will shrink. We suggest dry cleaning or spot cleaning to keep our wool blend felt in its original condition. It's easy and already looks great! But there are times that a toy or a t-shirt just needs be washer friendly. Before cutting into your design or appliqué -the felt must first be washed. Prewash in a sink of hot running water -immersing the felt completely. We use soap and gently squeeze the felt into a ball, rinsing and repeating until the water runs clear. This process does two things to the felt. First the hot water gets any excess dye out. Not all colors bleed -but this bright Carmine did! Second, the combination of hot water, soap and gentle squeezing is further felting the fabric -binding the fibers even closer together and causing the felt to shrink. Lay flat to dry -or use a blow dryer to speed things up. A washing machine on the delicate cycle is a great alternative to prep large batches. In the image above you can see the difference between our original felt and felt that has been pre-washed. The washed felt is bubbly or wrinkled -and is thicker then its un-washed partner (this can be flattened by ironing though). Also it has shrunk. The 6x6" square shrunk to about 5 3/4x 5 1/2". Now you're ready to craft! Grab a t-shirt and your favorite color of Benzie's felt. To make cutting ultra easy we used the Nesting Star die from Lifestyle crafts -but old fashioned pattern and scissors will work just as well. We also found that we really liked Wonder Under's fusible adhesive. It's didn't make the felt appliqué stiff and it made a permanent bond to the fabric. But before you do any of these steps -your felt and your shirt must be prewashed! Follow the washing instructions for felt above. 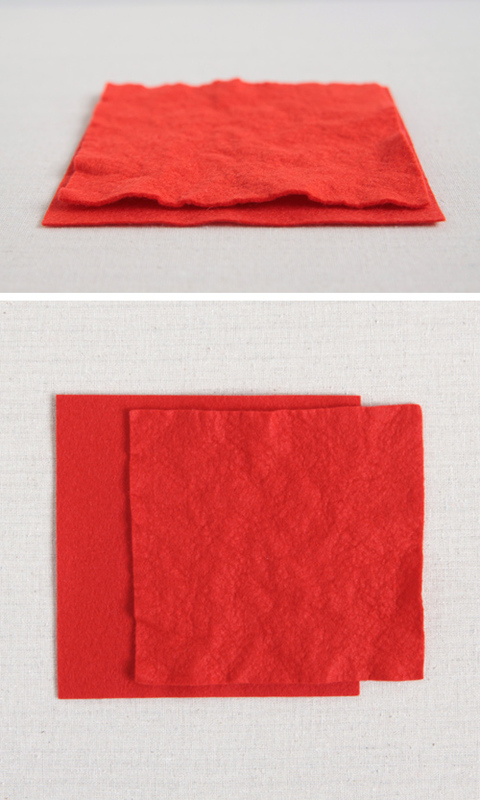 1) After the felt has dried -iron your fusible adhesive to your felt. 2). Use your favorite die to cut a shape our of the felt -adhesive side up. We explain how to use a die machine and dies here. 3. 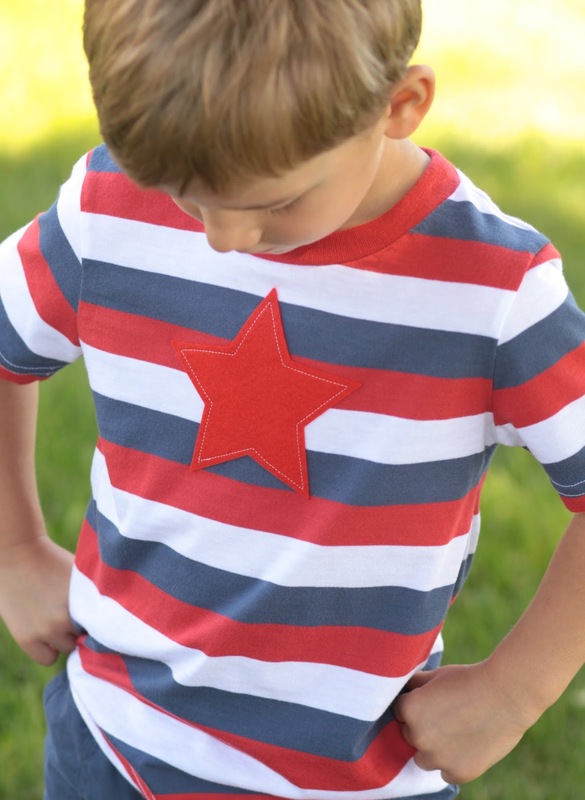 Peel off the top layer of your fusible adhesive -you can see the transparent paper star in the above photo (throw that away), carefully place your star where you want it and iron down. Iron from both the front and back of the shirt to ensure a permanent bond. It's not necessary -but I think the added machine stitch adds detail and helps the star to stand out among the stripes. To care for your felt appliqué shirt and prevent further felting we suggest washing inside out, cold and delicate with a gentle dry. I want to see what you are making too -hashtag #benziefelt and have a Happy Independence Day!